CSDP: Is There a Next Chapter? Amongst commentators, it is fashionable to highlight the persistent military weakness of the European Union by comparison with the United States or NATO, ignoring the progress achieved since 1999. This paper will attempt to examine the development of the Common Security and Defence Policy (CSDP), a difficult, often slow and undoubtedly incomplete process, before examining possible ways forward to strengthen CSDP credibility as the EU prepares for the December 2013 Defence Council. The European Union’s limited capacity and the fairly diversified interests of its Member States have proven to be the most significant contributors to its constrained capacity to tackle economic and financial problems at the international level. This problem has become only more acute and transparent with the outbreak of the recent global financial crisis. The crisis elevated some “less popular” items on the EMU-related agenda to the level of “bread-and-butter” ones; it has also expanded that agenda into areas that, so far, have not been considered the core, such as supervisory issues. Caught between high expectations and an unwilling commitment from the other parts of the EU foreign policy-making machinery (read: the Member States and the Commission), the EEAS has been struggling to find its role: is it a clearing-house or secretariat for reaching consensus among national positions, a ministry implementing foreign policy, a manager of a network of delegations abroad, or a policy entrepreneur? Philippe Esper, Christian De Boissieu, Pierre Delvolvé, Christophe Jaffrelot: A World Without Europe? The views expres­sed in The Po­lish Qu­ar­ter­ly of In­ter­na­tio­nal Af­fa­irs are so­le­ly tho­se of the au­thors. The Po­lish Qu­ar­ter­ly of In­ter­na­tio­nal Af­fa­irs is re­gu­lar­ly pre­sen­ted in the ca­ta­lo­gue of In­ter­na­tio­nal Cur­rent Awa­re­ness Se­rvi­ces, in Ulrich’s In­ter­na­tio­nal Pe­rio­di­cal Di­rec­to­ry, and in In­ter­na­tio­nal Po­li­ti­cal Scien­ce Abs­tracts/Do­cu­men­ta­tion Po­li­ti­que In­ter­na­tio­na­le. Se­lec­ted ar­tic­les are in­c­lu­ded in the In­ter­na­tio­nal Bi­blio­gra­phy of the So­cial Scien­ces. The year 2013 has be­co­me–qu­ite une­xpec­te­dly–a year of vi­vid di­scus­sions abo­ut the sta­te of Eu­ro­pe­an de­fen­ce. The Eu­ro­pe­an Co­un­cil ses­sion de­vo­ted to the to­pic and sche­du­led for De­cem­ber is only a par­tial re­ason for the in­cre­ased in­te­rest of go­vern­ments, po­li­cy experts and, al­be­it to a les­ser extent, me­dia in the re­la­ti­ve­ly lit­tle known EU Com­mon Se­cu­ri­ty and De­fen­ce Po­li­cy (CSDP). The main dri­vers of the di­sco­ur­se have been chan­ges in the Eu­ro­pe­an stra­te­gic ne­igh­bo­ur­ho­od, ma­king urgent the qu­estion of Eu­ro­pe’s cur­rent and fu­tu­re ca­pa­ci­ty to re­spond to cri­ses de­ve­lo­ping on its do­or­step. In­de­ed, in 2013 the­re has been plen­ty of tur­mo­il near Eu­ro­pe. The use of che­mi­cal we­apons in Sy­ria’s ci­vil war trig­ge­red mo­un­ting U.S. pres­su­re of mi­li­ta­ry in­te­rven­tion aga­inst the As­sad re­gi­me, which was even­tu­al­ly hal­ted by a last mi­nu­te Rus­sian-Ame­ri­can ac­cord to se­cu­re the we­apons. In Mali, a ro­bust French mi­li­ta­ry in­te­rven­tion for­ce was ne­eded to push Is­la­mic extre­mi­sts out of the north of the co­un­try, whe­re they had be­gun to cre­ate a safe ha­ven for ter­ror and other vio­lent acts, re­sem­bling that of pre-2001 Afgha­ni­stan. Also, a mi­li­ta­ry coup sho­ok Egypt, le­ading to a new wave of stre­et vio­len­ce and put­ting into qu­estion the de­mo­cra­tic fu­tu­re of the co­un­try. Me­an­whi­le, Li­bya fell into cha­os, mar­ked by re­gu­lar cla­shes be­twe­en clans and the fa­ilu­re of the cen­tral go­vern­ment to extend its po­wer to ter­ri­to­ries other than aro­und Tri­po­li. The so­me­what less tur­bu­lent Eastern ne­igh­bo­ur­ho­od of Eu­ro­pe wit­nes­sed, ho­we­ver, the fur­ther streng­the­ning of au­tho­ri­ta­rian re­gi­mes and, at the same time, a de­te­rio­ra­tion of pro­spects for so­lving Eu­ro­pe’s re­ma­ining fro­zen con­flicts, as well as a growth in mi­li­ta­ry po­wer. Far­ther, but di­rec­tly tied to Eu­ro­pe in many ways, the pro­spects for a go­ver­na­ble Afgha­ni­stan after the wi­th­dra­wal of NATO for­ces, plan­ned for 2014, have gra­du­al­ly fa­ded. At the same time, Eu­ro­pe­ans have fal­len de­eper into a vi­cio­us cyc­le of cuts in de­fen­ce bud­gets fol­lo­wing the wi­th­dra­wal of mi­li­ta­ry as­sets. The de­ve­lop­ment in com­mon of mi­li­ta­ry ca­pa­bi­li­ties, nick­na­med “po­oling and sha­ring” or “smart de­fen­ce,” was me­ant to be an an­swer to au­ste­ri­ty but has not li­ved up to the­ir high ho­pes. Sin­ce the launch of both in­i­tia­ti­ves in 2011/2, only some in­i­tial steps have been ta­ken to ge­ne­ra­te sa­vings from jo­int tra­ining or ma­in­te­nan­ce of as­sets, whi­le no si­gni­fi­cant jo­int arms pro­cu­re­ment/de­ve­lop­ment pro­ject has been star­ted, if any at all. The yaw­ning gaps in Eu­ro­pe’s mi­li­ta­ry po­stu­re–such as mi­da­ir re­fu­el­ling, pre­ci­sion gu­ided mu­ni­tions, stra­te­gic air­lift, dro­nes, and ad­van­ced in­tel­li­gen­ce sys­tems–have only wi­de­ned as the next bat­ches of we­apons were wi­th­drawn from se­rvi­ce due to the end of the­ir li­fe­cyc­les (e.g., Bri­tish Har­rier jets) or unbe­ara­ble co­sts (e.g., Ger­ma­ny’s fa­iled UAV pro­ject). To make mat­ters wor­se, the de­ba­te on Eu­ro­pe’s stra­te­gic in­te­re­sts, go­als and to­ols it wants to em­ploy to pur­sue them, as well as the ove­rall vi­sion of the Old Con­ti­nent’s role in in­ter­na­tio­nal se­cu­ri­ty po­li­cy, has been stuck for years. A cle­ar vic­tim of the stra­te­gic sta­le­ma­te is pre­ci­se­ly CSDP. Me­ant to be the ul­ti­ma­te tool to give the EU a long-awa­ited, U.S.-in­de­pen­dent fo­othold in glo­bal se­cu­ri­ty and de­fen­ce po­li­cy, it is only hal­fway the­re. The im­pres­si­ve re­cord of al­most 30 pe­ace-and-sta­bi­li­sa­tion ope­ra­tions laun­ched by the EU sin­ce 2003 in Eu­ro­pe, Afri­ca, the Mid­dle East and even Asia, has he­avi­ly con­tra­sted with the unwil­lin­gness to so­lve the struc­tu­ral flaws of CSDP. The­se flaws in­c­lu­de the lack of a ge­nu­ine com­mand-and-con­trol sys­tem, li­mi­ted ad­van­ce-plan­ning me­cha­ni­sms, in­suf­fi­cient in­ter-in­sti­tu­tio­nal co­or­di­na­tion and, last but not le­ast, the EU Mem­ber Sta­tes’ fa­ilu­re to im­ple­ment or even se­rio­usly di­scuss the no­vel and am­bi­tio­us pro­vi­sions of the 2009 Lis­bon Tre­aty, tho­ugh de­si­gned and ad­op­ted by the very same sta­tes to bo­ost ca­pa­ci­ty in se­cu­ri­ty and de­fen­ce (such as Per­ma­nent Struc­tu­red Co­ope­ra­tion in De­fen­ce, or PE­SCO). In other words, Eu­ro­pe­ans’ wil­lin­gness and ca­pa­bi­li­ty to mi­li­ta­ri­ly re­spond to cri­ses has shrunk at a time of in­cre­asing chal­len­ges to its se­cu­ri­ty and amidst wor­se­ning eco­no­mic con­di­tions. It is a pret­ty grim pic­tu­re, and the 2013 Eu­ro­pe­an Co­un­cil on De­fen­ce is not expec­ted to chan­ge it. It was a po­pu­lar as­sump­tion that out of the three “ba­skets” of is­su­es to be de­ba­ted in Brus­sels by the EU he­ads of sta­te and go­vern­ment, the de­fen­ce in­du­stry wo­uld be the most im­por­tant be­cau­se it was re­la­ti­ve­ly less con­tro­ver­sial (the others are CSDP in­sti­tu­tions and ca­pa­bi­li­ties). So­me­thing, ho­we­ver, has chan­ged. The pre­pa­ra­tion pe­riod cre­ated an une­xpec­ted snow­ball ef­fect. Experts, who used the op­por­tu­ni­ty to once aga­in po­int out the EU’s de­fi­cien­cies in re­gards to its se­cu­ri­ty and de­fen­ce stan­ding, as well as Eu­ro­pe­an go­vern­ments have star­ted to open­ly di­scuss the CSDP’s pro­blems. A num­ber of more or less am­bi­tio­us non-pa­pers and po­si­tion re­ports have been pre­sen­ted by key EU play­ers–both Mem­ber Sta­tes and EEAS of­fi­cials–over the co­ur­se of the year–all of them vo­cal­ly ack­now­led­ging the CSDP’s we­ak­nes­ses and ar­gu­ing that wi­tho­ut stron­ger mi­li­ta­ry te­eth, the Union will not be re­ady to sa­fe­gu­ard its glo­bal in­te­re­sts. Fur­ther, the Co­un­cil me­eting has come to be por­tray­ed as a di­scus­sion on the sta­te of Eu­ro­pe­an de­fen­ce ra­ther than on CSDP it­self, put­ting ove­rall de­fen­ce is­su­es such as re­la­tions with NATO and the part­ner­ship with the U.S. on the pla­te of the Eu­ro­pe­an Union for the first time ever. Con­se­qu­en­tly, just a few we­eks be­fo­re the Eu­ro­pe­an Co­un­cil ses­sion, expec­ta­tions are hi­gher than they were a year ago. No­ne­the­less, no one sho­uld as­su­me that the EU he­ads of sta­tes and go­vern­ment will agree to bre­ak­th­ro­ugh chan­ges in CSDP or give new im­pe­tus to Eu­ro­pe­an de­fen­ce. No, the Co­un­cil will ra­ther start a pro­cess to ad­dress core we­ak­nes­ses in EU mi­li­ta­ry af­fa­irs (and bro­adly spe­aking, Eu­ro­pe), like the lack of upto-date stra­te­gic gu­idan­ce, fla­wed struc­tu­res and pro­ces­ses go­ver­ning CSDP, and in­suf­fi­cient EU-NATO co­ope­ra­tion. If it is a good be­gin­ning, cre­ating a blu­eprint of tan­gi­ble re­sults which co­uld ma­te­ria­li­se in a few years. Let’s hope this is the case as fu­tu­re cri­ses will not wait until Eu­ro­pe fi­xes its to­ols and ef­fec­ti­ve­ly ad­dres­ses the­ir short­co­mings. With that in mind, I wo­uld like to in­vi­te you to explo­re this spe­cial vo­lu­me of the Po­lish Qu­ar­ter­ly of In­ter­na­tio­nal Af­fa­irs. It pre­sents ar­tic­les on key is­su­es li­ke­ly to be de­ba­ted du­ring the De­cem­ber 2013 Eu­ro­pe­an Co­un­cil ses­sion. Writ­ten by excel­lent au­thors who bo­ast a num­ber of aca­de­mic and po­li­cy pa­pers re­gar­ding Eu­ro­pe­an de­fen­ce and CSDP, the­se es­says aim to give an ove­rview of the key chal­len­ges for the EU in the se­cu­ri­ty and de­fen­ce po­li­cy do­ma­in. As the twi­sts and turns of in­ter­na­tio­nal se­cu­ri­ty and de­fen­ce po­li­cy, and spe­ci­fi­cal­ly CSDP, make it easy for any­one to be­co­me lost in the mi­nu­tia, I hope that the vo­lu­me of the PQ you are hol­ding in your hands can se­rve as a ro­ad­map, hel­ping you to bet­ter un­der­stand the­se com­pli­ca­ted, and at the same time, fun­da­men­tal is­su­es. En­joy! CAMILLE GRANDCSDP: Is There a Next Chapter? In the so­me­ti­mes cha­otic jo­ur­ney to­wards the cre­ation of Eu­ro­pe­an de­fen­ce, the Fran­co-Bri­tish sum­mit in Sa­int Malo on 4 De­cem­ber 1998 gave birth to the mo­dern vi­sion of Eu­ro­pe­an de­fen­ce and led to the es­ta­bli­sh­ment of the Eu­ro­pe­an Se­cu­ri­ty and De­fen­ce Po­li­cy (ESDP) at the Co­lo­gne Eu­ro­pe­an Co­un­cil in 1999, de­mon­stra­ting the dy­na­mic be­twe­en bi­la­te­ral and mul­ti­la­te­ral pro­ces­ses. This sha­red vi­sion emer­ged in li­ght of the fa­ilu­res of Eu­ro­pe in the Bo­snian cri­sis, and of Euro-Ame­ri­can dif­fe­ren­ces on the is­sue. This view was echo­ed by all the Mem­ber Sta­tes of the Eu­ro­pe­an Union at the Koln Eu­ro­pe­an Co­un­cil, which for­mal­ly es­ta­bli­shed the ESDP and mar­ked the trans­fer to the EU of the mi­li­ta­ry po­wers ve­sted in the late We­stern Eu­ro­pe­an Union (WEU). Fi­fte­en years la­ter, it is in­te­re­sting to un­der­go a cri­ti­cal as­ses­sment of this pro­cess. Amongst com­men­ta­tors, it is fa­shio­na­ble to hi­gh­li­ght the per­si­stent mi­li­ta­ry we­ak­ness of the Eu­ro­pe­an Union by com­pa­ri­son with the Uni­ted Sta­tes or NATO, igno­ring the pro­gress achie­ved sin­ce 1999. This pa­per will at­tempt to exa­mi­ne the de­ve­lop­ment of the Com­mon Se­cu­ri­ty and De­fen­ce Po­li­cy (CSDP), a dif­fi­cult, often slow and un­do­ub­te­dly in­com­ple­te pro­cess, be­fo­re exa­mi­ning po­ssi­ble ways for­ward to streng­then CSDP cre­di­bi­li­ty as the EU pre­pa­res for the De­cem­ber 2013 De­fen­ce Co­un­cil. Es­ta­bli­shing ESDP/CSDP was not an easy en­de­avo­ur as the Mem­ber Sta­tes do not sha­re a com­mon stra­te­gic cul­tu­re, and have very dif­fe­rent ap­pro­aches to the use of for­ce, the re­la­tion­ship to NATO or the re­le­van­ce and im­por­tan­ce of a mi­li­ta­ry di­men­sion for the EU and obvio­usly have very dif­fe­rent geo­gra­phic fo­cu­ses. Even then, CSDP very much ap­pe­ars to be a work in pro­gress and the EU, at best, a te­ena­ger when it co­mes to de­fen­ce is­su­es, it is in­te­re­sting to take stock of the pro­gress achie­ved so far, which has tur­ned the EU from a se­cu­ri­ty con­su­mer into a si­gni­fi­cant se­cu­ri­ty pro­du­cer. Eu­ro­pe has fi­nal­ly be­co­me a mi­li­ta­ry play­er. The pro­cess in­i­tia­ted in Sa­int Malo and conc­lu­ded with the Lis­bon Tre­aty has been pri­ma­ri­ly fo­cu­sed on the de­ve­lop­ment of in­sti­tu­tio­nal to­ols to give the EU the me­ans to act. It wo­uld be fa­sti­dio­us to en­ter here into a com­pre­hen­si­ve de­scrip­tion of the com­plex sys­tem es­ta­bli­shed be­twe­en 1999 and 2010, which brings to­ge­ther the High Re­pre­sen­ta­ti­ve and the Eu­ro­pe­an Exter­nal Ac­tion Se­rvi­ce (EEAS), the Po­li­ti­cal and Se­cu­ri­ty Com­mit­tee (PSC) en­sh­ri­ning the role of EU Mem­ber Sta­tes in CFSP and CSDP, and the mi­li­ta­ry di­men­sion com­po­sed of the EU Mi­li­ta­ry Com­mit­tee (EUMC), com­po­sed of the Chiefs of Staff of the Mem­ber Sta­tes or the­ir re­pre­sen­ta­ti­ves, which gi­ves mi­li­ta­ry ad­vi­ce to the PSC and EU Mi­li­ta­ry Staff (EUMS), which pro­vi­des exper­ti­se and mi­li­ta­ry sup­port. The Eu­ro­pe­an De­fen­ce Agen­cy (EDA) is also es­ta­bli­shed as a tool for ca­pa­bi­li­ty de­ve­lop­ment, re­se­arch and de­ve­lop­ment in the field of ar­ma­ments and tech­no­lo­gy. It sho­uld be no­ted that along­si­de the de­ve­lop­ment of ESDP to­ols the EU-NATO “Ber­lin Plus” agre­ements were ne­go­tia­ted, which, sin­ce De­cem­ber 2002, al­low the Eu­ro­pe­an Union to use the me­ans of com­mand of the Atlan­tic Al­lian­ce un­der the con­trol of D-SA­CEUR. Sin­ce then, this for­mu­la has been used on re­gu­lar ba­sis in the Bal­kans (Ope­ra­tion Con­cor­dia in the For­mer Yugo­slav Re­pu­blic of Ma­ce­do­nia in 2003-2005, Ope­ra­tion Al­thea in Bo­snia and He­rze­go­vi­na sin­ce 2004), but au­to­no­mo­us EU ope­ra­tions using na­tio­nal ope­ra­tio­nal he­adqu­ar­ters (OHQ) have been the pre­fer­red option used re­pe­ate­dly sin­ce 2003. The de­ba­te re­ma­ins open on the es­ta­bli­sh­ment of a more for­mal and per­ma­nent Eu­ro­pe­an OHQ, which cur­ren­tly exi­sts only in em­bry­onic form but which co­uld expand in ti­mes of cri­sis, sho­uld the need ari­se. Al­to­ge­ther, the EU has suc­cess­ful­ly de­ve­lo­ped the in­sti­tu­tio­nal to­ols for cri­sis ma­na­ge­ment for both ci­vi­lian and mi­li­ta­ry cri­ses. Fur­ther in­sti­tu­tio­nal de­ve­lop­ments ap­pe­ar un­ne­ces­sa­ry. Com­pa­red to the ear­ly years of ESDP, the EU now has the le­gal and po­li­ti­cal me­ans to act whe­ne­ver it cho­oses to do so. In an une­xpec­ted pa­ra­dox, as the EU is often de­scri­bed as no­ne­xi­stent in the mi­li­ta­ry sphe­re, the EU has laun­ched no fe­wer than 29 mis­sions un­der the ESDP/CSDP la­bel; this to­tal in­c­lu­des mo­stly ci­vi­lian or ci­vi­lian-mi­li­ta­ry ope­ra­tions, but also in­c­lu­des se­ve­ral si­gni­fi­cant mi­li­ta­ry ope­ra­tions. Over the last de­ca­de, the EU has been en­ga­ged in the Bal­kans, Sub-Sa­ha­ran Afri­ca, the Mid­dle East, Afgha­ni­stan, So­uthe­ast Asia, the Cau­ca­sus, re­cen­tly in the Sa­hel, and in the In­dian Oce­an. The­se mis­sions or ope­ra­tions have co­ve­red a very wide spec­trum. Some in­vo­lved a few do­zen ob­se­rvers or po­li­ce and ci­vi­lian ad­vi­sers (Aceh and Iraq). Others led to the de­ploy­ment of se­ve­ral tho­usand sol­diers (Bo­snia and Chad). Tho­ugh most often they have been gro­und ope­ra­tions, the “Ata­lan­ta” an­ti­pi­ra­cy ope­ra­tion off the co­ast of So­ma­lia mar­ked the suc­cess­ful in­vo­lve­ment of the EU in the na­val field. They were laun­ched in­de­pen­den­tly with the use of the me­ans of Ger­man, French or Bri­tish na­tio­nal OHQs, or took ad­van­ta­ge of Ber­lin Plus com­mand ar­ran­ge­ments es­ta­bli­shed with NATO. Some were mo­un­ted in ad­di­tion to or in sup­port of UN mis­sions (twi­ce in the De­mo­cra­tic Re­pu­blic of Con­go, and in Mali), the Afri­can Union (Chad) or NATO (Ko­so­vo and Afgha­ni­stan), so­me­ti­mes on short no­ti­ce in re­spon­se to cri­ses (Itu­ri in Con­go or in Geo­r­gia), so­me­ti­mes in a plan­ned re­lay lo­gic with NATO (Al­thea in Bo­snia and He­rze­go­vi­na). They have in­vo­lved al­most all the co­un­tries of the Eu­ro­pe­an Union, and third co­un­tries were as­so­cia­ted on a re­gu­lar ba­sis. The long jo­ur­ney sin­ce 1998 sho­uld not lead one to for­get that CSDP is still un­der con­struc­tion. Three ma­jor chal­len­ges will de­ter­mi­ne the full im­ple­men­ta­tion of the Eu­ro­pe­an de­fen­ce pro­ject, the­se are key ob­jec­ti­ves for the next de­ca­de. The Chal­len­ge of Mi­li­ta­ry Cre­di­bi­li­ty The EU must be­co­me more cre­di­ble: its mi­li­ta­ry ca­pa­bi­li­ties fall short of its po­li­ti­cal-mi­li­ta­ry am­bi­tions and, as de­fen­ce spen­ding is dec­li­ning al­most eve­ry­whe­re in Eu­ro­pe, re­ver­sing this trend sho­uld be­co­me a prio­ri­ty. In the field of ca­pa­bi­li­ties, the in­i­tia­ti­ves of the pre­vio­us cyc­le (1998-2013) have not bor­ne fru­it. The ob­jec­ti­ve of pro­vi­ding the Eu­ro­pe­an Union with “cre­di­ble mi­li­ta­ry for­ces” has been sta­ted re­pe­ate­dly sin­ce 1998. In 1999, the Hel­sin­ki Eu­ro­pe­an Co­un­cil expres­sed a cle­ar goal: the EU sho­uld be able to de­ploy 60,000 tro­ops wi­thin 60 days for a pe­riod of one year (Hel­sin­ki He­adli­ne Goal). Fol­lo­wing the es­ta­bli­sh­ment of this He­adli­ne Goal (HG), a ca­ta­lo­gue of ca­pa­bi­li­ties re­ve­aled we­ak­nes­ses in 64 are­as to which, in most ca­ses, no sa­tis­fac­to­ry an­swer has been pro­vi­ded de­spi­te two com­ple­men­ta­ry in­i­tia­ti­ves aimed at streng­the­ning ca­pa­bi­li­ties. In or­der to mo­bi­li­se EU Sta­tes to achie­ve the­se ca­pa­bi­li­ty ob­jec­ti­ves, the Eu­ro­pe­an De­fen­ce Agen­cy (EDA) was cre­ated, tho­ugh it has not yet achie­ved the expec­ted re­sults gi­ven the lack of a real com­mit­ment on the part of the Mem­ber Sta­tes. The launch of the Bat­tle­gro­up 1500 con­cept (BG 1500 or EU Bat­tle­gro­ups), laun­ched in June 2004, was also aimed at streng­the­ning the ca­pa­ci­ty for an im­me­dia­te re­spon­se from the EU by es­ta­bli­shing ra­pid re­ac­tion for­ces of 1,500 per­son­nel per­ma­nen­tly ava­ila­ble, on ro­ta­tion, to re­spond to cri­ses. Unfor­tu­na­te­ly no bat­tle­gro­up has been de­ploy­ed in al­most 10 years, ca­sting do­ubts abo­ut the use­ful­ness of such a con­cept of high re­adi­ness stand­by for­ces. This is all the more unfor­tu­na­te as the­re have been se­ve­ral mis­sed op­por­tu­ni­ties to de­ploy them, as a co­uple re­cent ca­ses de­mon­stra­te. A Bat­tle­gro­up co­uld have been de­ploy­ed in Mali not so much to fi­ght along­si­de the French for­ces but to se­cu­re Ba­ma­ko air­port and fa­ci­li­ta­te the ear­ly ar­ri­val of the Afri­can for­ce. In­for­mal calls by the UN to de­ploy a Eu­ro­pe­an for­ce in Con­go (DRC) are just ano­ther exam­ple of the po­ten­tial for de­ploy­ment not fol­lo­wed by ac­tion. De­spi­te all the­se ef­forts, and al­most 15 years after Hel­sin­ki and 10 years after the ad­op­tion of a re­vi­sed ver­sion, the in­i­tial ca­pa­bi­li­ty goal has not been re­ached. Of 1.6 mil­lion Eu­ro­pe­an sol­diers, only 20% are con­si­de­red de­ploy­able and only a few tho­usand are ac­tu­al­ly en­ga­ged in ope­ra­tions that ran­ge from na­tio­nal or EU to NATO or UN mis­sions. In the re­cent past, much of this ef­fort is bor­ne by se­ven co­un­tries (UK, Fran­ce, Ger­ma­ny, Ita­ly, Ne­ther­lands, Spa­in, and Po­land), which have de­ploy­ed up to se­ve­ral tho­usand sol­diers, whi­le 21 other Mem­ber Sta­tes have ne­ver de­ploy­ed more than a few hun­dred sol­diers. Mo­re­over, after Iraq and as lar­ge de­ploy­ments in Afgha­ni­stan come to an end, the ac­tu­al num­ber of tro­ops de­ploy­ed abro­ad is dec­li­ning as Eu­ro­pe­an go­vern­ments seem in­cre­asin­gly re­luc­tant to send them abro­ad. Con­tra­ry to po­pu­lar be­lief, the qu­estion is not stric­tly fi­nan­cial. Whi­le it is im­por­tant to avo­id a con­ti­nu­ous dec­li­ne, year after year, in Eu­ro­pe­an de­fen­ce bud­gets, Eu­ro­pe’s to­tal de­fen­ce spen­ding still equ­al­led €194 bil­lion in 2012, se­cond only to the Uni­ted Sta­tes. In prac­ti­ce, Eu­ro­pe­an for­ces re­ma­in too often the ar­mies of the Cold War, de­di­ca­ted to ter­ri­to­rial de­fen­ce and not to mo­dern pro­jec­tion ca­pa­bi­li­ties. Less than 15% of the mo­ney spent is used for the acqu­isi­tion of mo­dern we­apon­ry, and ef­fort is only ra­re­ly fo­cu­sed on prio­ri­ty ca­pa­bi­li­ties and even more ra­re­ly on jo­int de­ve­lop­ment pro­gram­mes. This EU am­bi­tion was ba­sed on the expe­rien­ce of past or cur­rent ope­ra­tions and co­ve­red a wide and more ac­cu­ra­te ran­ge of sce­na­rios that went bey­ond the fra­me­work of the mis­sions in the Bal­kans, which had pre­si­ded over the de­ve­lop­ment of Hel­sin­ki He­adli­ne Go­als. The lack of pro­gress sin­ce 2008 po­ints at two ma­jor dif­fi­cul­ties to move from com­mit­ments to ac­tion: streng­the­ning the de­fen­ce ef­fort whi­le the EU ave­ra­ge stands clo­se to 1% of GDP and re­du­ce di­spa­ri­ties be­twe­en Eu­ro­pe­an co­un­tries. Be­aring in mind that Fran­ce and the Uni­ted King­dom ac­co­unt for clo­se to half of EU de­fen­ce spen­ding, we me­asu­re how the­se dif­fe­ren­ces are im­por­tant. This ra­ises the qu­estion, ho­we­ver, of de­epe­ning co­ope­ra­tion amongst smal­ler gro­ups of like-min­ded, which has been the ma­jor de­ve­lop­ment sin­ce 2008 as if many co­un­tries no lon­ger re­lied on EU co­ope­ra­tion me­cha­ni­sms. The chal­len­ge of EU vi­si­bi­li­ty. CSDP sho­uld be more vi­si­ble. EU ac­tion is often not known when other or­ga­ni­sa­tions, such as NATO, com­mu­ni­ca­te much bet­ter, as if EU le­ader­ship was so­me­how em­bar­ras­sed of the mi­li­ta­ry di­men­sion of its exter­nal ac­tion. Pa­ra­do­xi­cal­ly, the Eu­ro­pe­an Union has be­co­me a mi­li­ta­ry ac­tor wi­tho­ut the Eu­ro­pe­ans be­ing ful­ly awa­re of it. This is due to a va­rie­ty of re­asons. First, the re­luc­tan­ce of EU in­sti­tu­tions and some Mem­ber Sta­te go­vern­ments to ad­mit to the pu­blic they par­ti­ci­pa­te in a po­li­ti­cal pro­ject with a mi­li­ta­ry di­men­sion le­ads them to pre­fer ad­op­ting a sort of low pro­fi­le, and to hi­gh­li­ght ci­vil or hu­ma­ni­ta­rian mis­sions whi­le re­ma­ining re­luc­tant to ad­mit that a gi­ven EU mis­sion is a mi­li­ta­ry ope­ra­tion com­pri­sing an ele­ment ofrisk. Se­cond, when the ro­ta­ting pre­si­den­cies tra­di­tio­nal­ly re­du­ced the EU vi­si­bi­li­ty, the post-Lis­bon or­ga­ni­sa­tion and le­ader­ship ap­pe­ared re­luc­tant to ra­ise the EU flag and push for new com­mit­ments with only a hand­ful of new mis­sions com­pa­red to the 2003-2008 pe­riod. Fi­nal­ly, and unli­ke other or­ga­ni­sa­tions such as NATO or the UN, CSDP has not de­ve­lo­ped the ri­ght com­mu­ni­ca­tion to­ols ad­ap­ted to this new EU role (spo­ke­sper­son, we­bsi­te, etc.). In the ab­sen­ce of a cle­ar mes­sa­ge co­ming from Brus­sels, CSDP re­ma­ins for most me­dia and the pu­blic an aw­kward in­sti­tu­tio­nal ob­ject, una­ble to de­li­ver. This re­luc­tan­ce to push for­ward CSDP and de­ve­lop it fur­ther is all the more stran­ge that Eu­ro­pe­ans lar­ge­ly sup­port the Eu­ro­pe­an de­fen­ce pro­ject as polls de­mon­stra­te year after year. 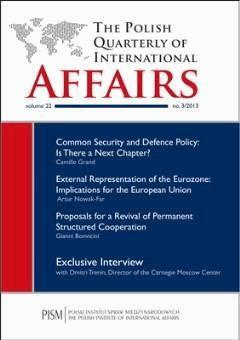 CSDP and Eu­ro­pe­an De­fen­ce: The Next Chap­ter? As Eu­ro­pe­an le­aders pre­pa­re the De­cem­ber 2013 De­fen­ce Co­un­cil, they need to ima­gi­ne the next chap­ter of Eu­ro­pe­an De­fen­ce that goes bey­ond CSDP, stric­tly spe­aking. The role play­ed by the Eu­ro­pe­an Com­mis­sion in the pre­pa­ra­to­ry pro­cess is in this con­text most im­por­tant. In or­der to achie­ve suc­cess and of­fer a next chap­ter to the es­ta­bli­sh­ment of the EU as a full-fled­ged stra­te­gic play­er se­ve­ral fi­les need to be ad­dres­sed urgen­tly.